Jackson, located in the northwest corner of Wyoming, is best known as a base for exploring the wonders of the Teton Mountains and Grand Tetons National Park. Home to around 9,500 residents, Jackson offers four seasons of outdoor activities, including some of the best skiing and fly fishing in the United States. For owners of South Jackson, Wyoming real estate, the area offers a wide range of attractions, including plentiful dining and recreation options, expansive lots and a small-town, friendly ambiance. South Jackson, Wyoming real estate owners don't have to venture far for shopping and dining. Unlike many resort areas, Jackson eschews chain restaurants and stores in favor of locally-owned establishments. Jackson shopping is based around Town Square in downtown Jackson. This western-themed plaza offers unique gift shops, sporting goods stores and a wonderful collection of art galleries, many of which feature the works of local artists. Restaurants in South Jackson run the gamut from casual to elegant. Some of the local favorites include the Snake River Brewery and Restaurant for relaxed, American cuisine and artisan-crafted brews; 43 North for elegant, fine dining featuring local produce and game; and Rendezvous Bistro for authentic French bistro fare. One of the best things about South Jackson, Wyoming real estate is the abundance of nearby opportunities for outdoor recreation. The area boasts four seasons of outdoor activities, including skiing, golf, fishing and more. There are three ski areas within a short drive of Jackson, including Jackson Hole Mountain Resort, Wyoming's largest and most popular ski resort. The Snake River, which flows just west of town, offers some of the best fly fishing in the United States. What's more, the 310,000-acre Grand Teton National Park is located just outside of town and Yellowstone National Park is just an hour's drive away. Both parks offer a plethora of hiking trails, rock-climbing opportunities, streams and recreational lakes. For more Western fun, the Jackson Hole Rodeo wows spectators twice a week between Memorial Day and Labor Day with calf-roping, bull-riding and other cowboy skills. South Jackson, Wyoming real estate is largely upscale and many properties include multiple acres and dramatic views of the Teton Mountains. Properties in the area, called "South Park" by the locals, are noted for their lush meadows and access to nearby fishing and hiking in the national parks that surround the neighborhood. 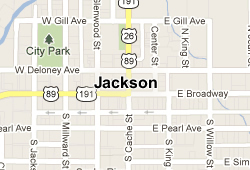 South Jackson is considerably more affordable than other parts of the city. Single family homes here with a quarter-acre lot start at around $400,000. Prices of townhomes in South Jackson start at around $300,000. Larger properties, with half to three-quarter-acre lots, start at around $600,000. This area also has a good selection of luxury homes, including those that surround 3 Creek Ranch, Jackson's only golf community. Such properties start at around $2.5 million. As this is horse country, many luxury homes also include access to horse trails and/or Jackson's equestrian center. Children of South Jackson attend Teton County School District schools. This district, which boasts a graduation rate of nearly 93 percent, includes Jackson, Teton Village, Wilson and the area surrounding Jackson. Facilities include six elementary schools, a middle schools and two high schools. Jackson Hole Community School in Jackson, a private college-prep school, offers an alternative to public schools. For higher education, the University of Wyoming has a branch in Jackson. For those with children considering South Jackson real estate, they can be confident that the quality of local education is indeed high. St. John's Medical Center is the major health care provider in Jackson. The 108-bed hospital, located in northeast Jackson, offers a wide range of inpatient and outpatient services. They also operate six outpatient clinics around the greater Jackson area. It's not difficult to get around South Jackson. State routes 89, 191 and 26 all traverse the city. In addition, South Teton Area Rapid Transit (START) buses connect the neighborhood with downtown Jackson. For longer trips, Jackson Hole Airport, located within Grand Teton National Park, is just a short drive away. The 533-acre facility offers non-stop flights to a number of US cities, including Houston, Chicago, Atlanta and Dallas.